All of our clients desire the ability to create the same looks we give them at home. The only way to do this is to use the right tools and the right ingredients! Call us to order any of our products. Shipping is $10.00 for anywhere in the U.S. Small makeup orders are only $5.00 shipping. Check out our expert tips! All natural, organic hair care for children. Fairy Tales Hair Care Products are unique blend of pure rosemary oils, lavender and tea tree extracts that act as a natural deterrent to lice and other insects. Rusk engineering tools are the best available anywhere! We use Rusk blades for cutting & texturizing. Rusk Products shined at the New York Fashion Show. Our newest service, Keratin Complex Hair Therapy, is a treatment that thermally replaces keratin back into the cuticle of each hair shaft, rejuvenating and smoothing the hair. Unlike other revitalizing and straightening treatments, commonly known as Brazilian Style Relaxers, Keratin Complex does not use any harsh and poisonous chemicals. The treatment is a complete process through science that allows the product to work by completely sealing the hair shaft with their patented polymerization process. The Beachwaver is the first ever rotating curling iron. It is hairstylists favorite and the wanted style by women worldwide. Bass brushes are the best available in the world! They are the same ones we use to style your hair! They are easy to use and provide smoothness. You will never need to buy another brush! 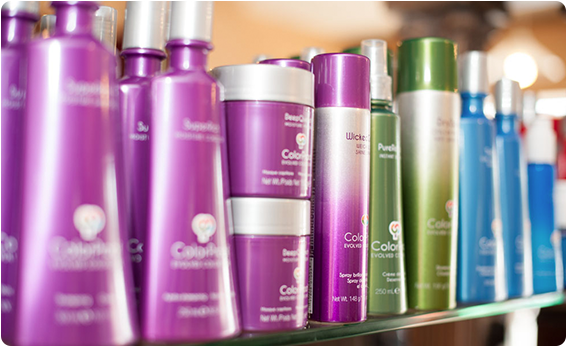 We use only the very best colour available with low or no ammonia - therefore, it's less damaging to the hair! GloTherapeutics is a revolutionary breakthrough in chemical exfoliation treatments. Our systematic approach is based on established research in combination with new scientific discoveries. 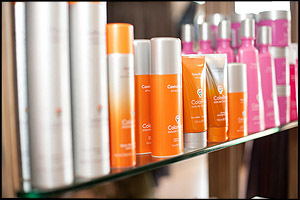 We carry the full line to correct or prevent most skin conditions. A collection of highly efficacious chemical exfoliants designed to offer a broad range of treatment options. Imagine a makeup that's good for your skin. Imagine a makeup that takes only a few minuets to apply. Imagine flawless coverage and colors that last all day. Blink Mascara is the original mascara invented to form tiny water-resistant 'tubes' around your lashes rather than painting them like conventional mascaras. Once applied, the tubes bind to your lashes and cannot run, smudge, clump, or flake, even if you cry or rub your eyes.